Until relatively recently, the reputation of the sixteenth century Netherlandish artist Pieter Bruegel , like that of northern painting in general, was considerably lower than it is today. Partly, this was due to the lingering effects of the disdain of Flemish art which had been expressed by Renaissance commentators . So, for example, the work of 15th century Flemish masters such as Jan van Eyck or roger van der Weyden, while highly prized after their death in their home countries, was dismissed as the work of "primitives", and Bruegel himself was generally considered to be a minor painter of genre scenes. However, particularly since the early 20th century, there has been a considerable re-assessment . In 1902, the first international show of 15th century Flemish masters was held, and major scholarly works soon appeared on Middle Ages art, and on Bruegel in particular . In this atmosphere of revived interest, the re-appearance in 1912 of a previously unknown work, supposedly by Bruegel, caused somewhat of a sensation, which was further heightened by its acquisition by the Musées Royaux des Beaux-Arts in Brussels (Fig 1) . The authenticity of Landscape with the Fall of Icarus, as this unsigned and undated work is now known, has often been a matter of contention. Many believed it to be a copy after a lost work by Bruegel, but others took the view that, despite its extensive overpainting, it was in fact a Bruegel original . Further fuel was added to the controversy by the discovery in 1935 of a second, slightly smaller version , almost identical but for two crucial differences – the inclusion of Icarus’s father Daedalus, and the positioning of the sun. This version, which surfaced in a private collection, is now in the Musée David et Alice van Buuren, Brussels (Fig 2) . As it happens, recent technical studies appear to have confirmed that ­both the Beaux-Arts version and the van Buuren version are copies of a lost work by Bruegel , though we still are not certain which copy is the more accurate . Nevertheless, the natural (and carefully-cultivated) competition between the two versions, together with the dramatic theme of death, and the number of enigmatic features (such as the unusual treatment of Icarus), were key factors contributing to their popular allure . Spirited views were expressed about which was superior and which, if either, was an original. Even more interest was aroused because of the strong attraction of the subject matter for 20th century poets – appropriately enough for a painting itself based on a classical poem. The most well-known of these was Auden, whose poem Musée des Beaux Arts, inspired by the painting in that museum, not only elevated the reputation of that version relative to the van Buuren version, but also, as we shall see, may have even had some influence on the actual interpretation of the painting. As the name implies, the painting is based on the myth of the mythic Fall of Icarus. This in itself is unusual, as Bruegel did not normally depict classical or mythological subjects. In fact, they appear only in this particular painting, in two other etchings of his involving Icarus  (Fig 3), and in his etching based on the fall of Phaethon . Both the Icarus and the Phaethon myths concern rash young men who, despite their fathers’ warnings, reach too high and are catastrophically cast down from the heavens . In Bruegel’s versions, both involve a fall over water, with sailing ships prominent, a human-bird transformation  and a lack of awareness of bystanders to the unfolding drama. 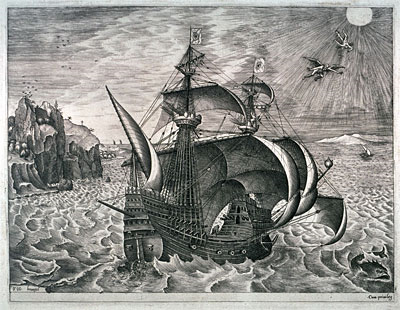 Fig 3: Pieter Bruegel the Elder, A Man-of-War near the Coast, with the Fall of Icarus (c 1562), etching, Fine Arts Museums of San Francisco California USA. The most comprehensive statement of the Icarus myth is by the Roman poet Ovid in his Metamorphosis . For our purposes, two episodes are crucial. Both, as it happens, implicate Icarus’ father Daedalus in the ill-fated fall of a child for whom he was responsible. Episode #1: Talos gets too clever: In the first episode, Daedalus’ sister, Perdix, sends her 12 year old son Talos to be an apprentice to Daedalus, a master craftsman. But Talos turns out to be even more inventive than his master. Seized with jealousy, Daedalus pushes Talos off the Acropolis rock, seemingly to his death. However, the goddess Minerva intervenes, catches him, and turns him into a partridge, “masking him with feathers in mid-air”. Talos, in his feathery new guise, takes his mother’s name, Perdix, and from then on, like a real-life partridge, always avoids heights. The second episode takes place against the background that Daedalus, who had earlier won fame by inventing the Labyrinth in Crete, has been imprisoned on that island with Icarus, as a result of committing some indiscretions that had angered the king, Minos. Episode #2: Icarus flies too high: Daedalus is desperate to escape from Crete. He recognises that Minos can thwart their escape by land or sea, “but the sky is surely open to us”. Daedalus therefore decides on a new invention which will “alter the natural order of things” – artificial wings, with feathers fastened by thread, fixed into a curve so that they imitated real birds’ wings, with bees’ wax at the base. Icarus, who is only young, messes about, laughing, more a hindrance than a help. Before they set off, with the wings fitted on their shoulders, Daedalus warns Icarus of the dangers of straying too high or too low. Miraculously, the wings work, and father and son fly into the sky. Ovid imagines that “some angler catching fish with a quivering rod, or a shepherd leaning on his crook, or a ploughman resting on the handles of his plough, saw them, perhaps, and stood there amazed, believing them to be gods able to travel the sky”. Then, fatefully, Icarus begins “to delight in his daring flight and, abandoning his guide, drawn by desire for the heavens”, soars higher. But his nearness to the sun melts the wax that holds the wings, and Icarus plunges to his death in the sea, which thereafter bears his name . The two episodes come together when the transformed partridge Perdix re-appears just as Daedalus is burying Icarus. The noisy bird is cackling joyfully, delighted that his own would-be murderer Daedalus is finally being punished by the death of his son. We can now turn to the painting itself. Bruegel’s setting is an interesting meld of Flemish farmland in the foreground, together with a wide sun-filled Mediterranean seascape, as seen from an elevated viewpoint more or less equivalent to a bird’s-eye view . As we have seen, Ovid’s poem asks the reader to imagine that some person – Ovid suggests an angler, shepherd or ploughman – may have stopped in his activities and been so amazed by the astonishing sight of Daedalus and Icarus flying high above that he thought they must be gods. Bruegel follows Ovid’s suggestion that one of the workers may have witnessed the flight, and chooses the shepherd leaning on his crook . Bruegel also includes the other two Ovid-based characters, the ploughman and the fisherman. However, he sets the scene at a later stage than in the Ovid version, when Icarus has already fallen into the water. (In fact, despite its name, the painting does not actually depict Icarus’ fall – just its impact.) The richly-dressed ploughman’s head is down, seemingly oblivious to Icarus’ fate. The fisherman, unobtrusive in the bottom right corner, is still fishing, looking towards the right unconcernedly. And the shepherd is looking up, still following the flight of Daedalus; this is explicit in the van Buuren version (Fig 2) , where the flying figure of Daedalus is shown looking anxiously around, but has to be implied in the Beaux-Arts painting (Fig 1), in which Daedalus is entirely absent. The tiny figure of Icarus, in the lower right corner, is a novel representation. Icarus is remarkably inconspicuous, with his almost comically flailing legs visible above the surface of the disturbed water (Fig 4). If you look very closely, you may discern an upturned hand to the left of Icarus’ legs, which suggests that Icarus may not have fallen into the water head first, as is commonly assumed, but is struggling underwater, which increases even further the pathos of the scene. Most viewers of the painting, the only remaining potential “witnesses”, overlook Icarus, at least initially. In fact, if you ignore the title, there is very little overt in the Beaux-Arts version to indicate that it is about Icarus at all . This distraction or misdirection is presumably deliberate, as the farm workers dominate the foreground, especially the ploughman who attracts attention because of his centrality, nearness, size and bright red shirt. This type of composition, which requires viewers to re-orient their initial focus, recalls other works of Bruegel’s where the crucial character is partly hidden – almost in a Where’s Wally way – for example, Christ falling beneath the weight of the cross in Christ carrying the Cross (1564); Mary and Joseph in The Census at Bethlehem (1566); Saul not being noticed as he is thrown from his horse in The Conversion of Saul (1567); and the manger scene hidden away in the left of The Adoration of the Kings in the Snow 1567 . This viewpoint has been likened to an “establishment shot” in a movie, the wide view of the setting before the camera moves in on the real area of action . The sun is crucial to the painting in a number of ways. It is, of course, essential for the future success of the ploughman’s crops, and for the present failure of Icarus. Positionally, its vast expanse, coupled with the slight curve of the horizon, give the painting an almost cosmological feel – this is not just a pretty, localised scene we are looking at; from our elevated viewpoint, we are seeing a part of the wide world. At the same time, the sun’s intense glow, coupled with the thinness of the oil paint applied by the artist, gives the painting a diffused airiness. Yet the sun also raises questions. One of the many odd aspects of the painting is that whereas one would expect the burning sun to be high in the heavens, the Beaux-Arts painting (Fig 1) has the bright yellow disc of the sun already sinking on the horizon, perhaps a visual echo of Icarus’s own sinking (this is not so in the Van Buuren version (Fig 2), where there is no specific disc of the sun shown, just the dazzling, diffused light centred higher in the sky). This may simply be a compositional device by Bruegel, but its position seems impossible to justify in realistic terms , unless one is able to imagine that Icarus went so high that the sun had time to set before Icarus reached sea level . Furthermore, if the sun really was on the horizon, one would also expect that the shadows of the ploughman’s furrows would be longer, and that the yellow glow reflected in the water would extend to the horizon, instead of being localised in the centre of the bay. In this respect the Van Buuren version, with its more elevated light source, seems to make more sense . Bruegel also picks up Ovid’s reference to the partridge, Perdix . Ovid had described the bird as gleefully mocking Daedalus as he is burying Icarus. Bruegel, however, shows the partridge at an earlier stage (in contrast to the farm workers, who are placed at a later time than in Ovid’s version), while the tragedy is still in progress, and seemingly quite placidly sitting on a branch of the tree just to the left of the fisherman (see Fig 4). Though close to Icarus, the bird is looking off to the right without directly observing the action, and without any human-like reaction. Fig 5: After Bruegel, Landscape with the Fall of Icarus. Detail showing supposed corpse in shrubbery. Wikimedia Commons. Bruegel also introduces two innovations to Ovid’s version of the myth. The first is the presence of what has been assumed to be the bleached corpse of an old man, lying on his back. We can only really see the man’s white head, a tiny detail at the far left of the painting, in the bushes at the end of the inclined ploughed field, and beyond the trunk of the tree (Fig 5). However, recent infrared reflectographical analysis has rather disconcertingly suggested that, contrary to appearances. the figure is in fact a defecating man, presumably included in the painting as an earthy vulgarism, reminiscent of the squatting figure in the left foreground of Bruegel’s Magpie on the Gallows . The other innovation is the ship, on the right, near Icarus, with its crewmen swarming in the rigging as it heads into the bay, possibly toward the port in the distance, its billowing sails recalling Icarus’ wings. The painting has been interpreted and reinterpreted in a bewildering number of partly-overlapping ways. These often present the painting as illustrating some sort of finger-wagging cautionary tale, with each interpretation being buttressed by its own selective collection of supportive proverbs, mythic references and/or Biblical quotations . Some of the interpretations focus on the actions (or inaction) of the peasants engaging in their traditional activities on the land; others focus on the literally outlandish actions of Daedalus and Icarus over the sea. Many also rely on the differences between Bruegel’s version and Ovid’s, and also between the Beaux-Arts version (much the more favoured) and the Van Buuren version. With these points in mind, let’s now attempt to make some sense of what the artist may have intended the painting to say. One common view is that the painting illustrates people’s attitude of not caring about other people’s suffering, or even deliberately ignoring it. This view notes that no-one has made any effort to help Icarus, even though his dramatic fall must have been obvious . So, the artist is basically converting the Icarus myth into an example of the proverb “A man dies, and the world hardly blinks” . This attitude would also extend to the presumed suffering represented by the figure in the shrubbery if in fact it were a corpse. For Auden, the painting confirmed his generally dispirited belief in universal human failure. It was a view which had been fostered by his recent first-hand experiences in observing the atrocities of the Sino-Japanese war . This seems to have struck a chord with some 20th century commentators who may have experienced human cruelty and suffering on a massive scale in two world wars. Another quite different approach focuses on the belief, apparently common in Bruegel’s era, that the peasants would be quite justified in failing or refusing to react, and by continuing to concentrate on their worthy labour. Similarly, the neglect of Icarus by the ploughman may reflect the immediately-following episode where Jesus says to another supporter, “No man who looks behind him, when he has once put his hand to the plough, is fitted for the Kingdom of God” . And the treatment of both Icarus and the corpse (if it is a corpse) may be reflected in the proverb to the effect that “no plough stops for a dying man” . On this view, the ploughman is seen as a paragon of industry, moderation, prudence and moral integrity – a symbol of honest labour towards salvation. So, in the case of Icarus, the ploughman should not allow himself to be diverted from his task by the admittedly tragic consequences of someone else’s foolish and extreme actions. While Icarus’ flight towards the heavens results in a fatal plunge to earth, the ploughman’s earthbound labours lead him to eternal life in heaven . A more general view, philosophical rather than religious, is simply that the painting highlights how tragedy and suffering can occur without people noticing – they are not deliberately uncaring; their only sin is self-absorbed inattentiveness. Contrary to Auden’s statement, there seems no evidence that the peasants are turning away from Icarus’ disaster; it just happens that they are not looking in that direction. Nor is the fall obvious, for the very reason that the ploughman already has his back turned, the shepherd (and his dog) are looking the other way, the fisherman is looking to the right away from Icarus, and the sailors in the rigging of the ship are too busy threading their ship through the narrow channel. In any event, they have hardly had any chance to react, as Icarus has just hit the water . This also applies to the fate of the shrubbery corpse (if it is a corpse), who is even less conspicuous than Icarus. On this view, Bruegel is simply acknowledging that reality can be brutal while lacking the element of malevolence or callousness, so that death and suffering are simply ordinary components of life, which must go on . On the assumption that the shrubbery figure is a corpse, it has been suggested that the two images of death – one supposedly “natural” and the other violent, complement each other, so that we see only the top part of the corpse and the bottom half of Icarus. It is only together that they form a complete person, bracketing the central character of the ploughman and the scene of normal, ongoing life . A further group of views focuses on the actions of Daedalus and Icarus. Some commentators argue that the painting illustrates that pride literally comes before a fall. Some proponents of this view concentrate on Daedalus’ pride, in believing that his own skills of craftsmanship could overcome the natural order, at the risk of his own son’s life; or for not asking for the gods’ forgiveness for entering their divine realm. The moral, it is said, is that it is pointless trying to transcend the natural limits of the human condition. More specifically, there is sometimes a suggestion that the painting is portraying the conflict between the growth of “technology” (represented by the manufacture of the artificial wings) and the maintenance of the social order (the traditional ways of life represented by the peasants). It has been argued that this view, focusing as it does on Daedalus, cannot be right, as it would presumably necessitate the presence of Daedalus in the painting. However, this objection is open to criticism on two grounds. The first is that it incorrectly treats the Beaux-Arts version (Fig 1) as the only authentic one. Secondly, even if Daedalus is absent, the myth was probably so well-known by this stage  that it is possible that Bruegel simply assumed that viewers would be familiar with it, and that showing Daedalus was unnecessary. Some commentators have even argued that the absence of Daedalus made the Beaux-Arts version the more “subtle” and “less literal” of the two versions and therefore, somehow, superior . Others commentators concentrate on Icarus’ pride, evidenced by his overconfidence, presumption and foolhardiness in getting too close to the sun. This view is probably the more popularly-understood view of the myth, if not the painting . Ovid himself appears to cut Icarus some slack, specifically mentioning his youth and his non-comprehension of the nature of the undertaking and its dangers. However, elsewhere, in his Trisitia, Ovid expresses scorn for both father and son, as both had false wings, and “one ought to remain within one's place assigned by Fortune” . Another, related, viewpoint is that the painting illustrates the importance of moderation, in steering a course that is not extreme, but in choosing the “middle way”. There is considerable evidence that this was a constant theme in Netherlandish painting – moderation and the acceptance of one’s lot in society, especially in the case of the lowly peasantry with their occasional tendency to get uppity . Ovid recounts that Icarus was warned by a concerned Daedalus that it was important “to take the middle way, in case the moisture weights down your wings; if you fly too low, or if you go too high, the sun scorches them”. However, once in flight, Icarus gets excited and flies high, and ultimately to his death. Icarus departs from moderation, the middle way, both because he is metaphorically carried away by the extremeness of his exultation, but also literally, because of the actual flight path that he takes. Daedalus, in contrast, takes the middle path and survives. The moral is made clear in the Ovid-based Latin caption to Bruegel’s 1553 etching: “How was it that Daedalus beat his wings more safely? That Icarus give the vast waters his name? / Surely because one flew high but the other flew lower down / For neither of the two of them had wings of his own . In the painting, the virtue of moderation is reinforced by the contrast with the hardworking ploughman, who is in the middle of the picture and appears to be emphatically ploughing the middle way in the field, and with the ship, which is sailing down the safe middle of the channel. While the image of the honest ploughman going about his tasks is seen as central to some of the interpretations we have considered, one commentator has recently put forward a radical reappraisal of the ploughman’s role. Yoni Ascher has suggested that the ploughman is actually a coded political reference . In support of this view, Ascher points to a number of anomalies in the way in which the ploughman is depicted in the painting. The first is his expensive-looking formal clothes, more suitable for a prince than a farm worker. 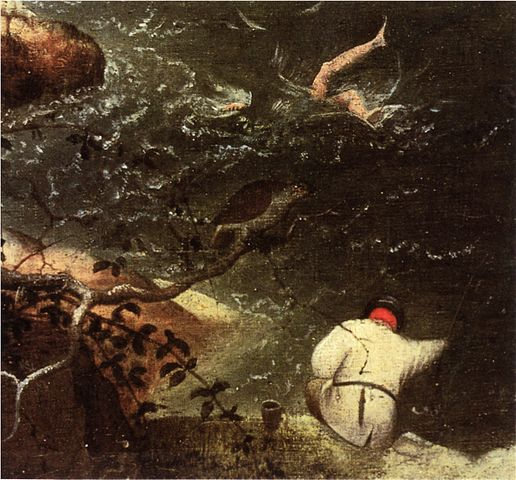 Fig 6: After Bruegel, Landscape with the Fall of Icarus. Detail showing sword/dagger and purse. The second is that he is using just the one horse, which Ascher argues would immediately raise the hackles of real ploughmen, as the plough being used would impose an extraordinary workload on the animal. In this connection, Ascher notes that subsequent Flemish depictions of Icarus all show the usual two horses pulling the plough. Ascher’s third anomaly is that, far from dutifully being absorbed in the ploughing, as is commonly assumed, the ploughman is actually positioned so that he is aligned away to the left, to such a degree that he has one foot on the actual furrow, apparently an unthinkable action for a competent ploughman. This leads Ascher to suggest that the ploughman has actually stopped ploughing and is leaving the field, heading left toward the dagger and the purse that lie on the mound below the figure of the horse (Fig 6). These two objects, outwardly so incongruous in a peaceful scene of ploughing, have traditionally caused difficulties of Interpretation. In Ascher’s view, however, they are the key to the real significance of the ploughman. The dagger signifies war and the purse signifies money. The ploughman is turning towards them because he signifies the ruler of the Netherlands at the time, Philip II of Spain. This king was hated by his Flemish subjects for levying harsh taxes on them to finance his war with France, a war in which the Netherlands felt that it had no part. Ascher states that Phillip was regarded as a despised outsider, one who further antagonised his unwilling subjects by an intense persecution of Calvinists. This interpretation of the ploughman, while novel, is not necessarily inconsistent with some of the other interpretations of the painting that we have discussed, and indeed reinforces aspects of them in some ways. Because of his taxation, warmongering and persecution, Philip can be seen as a person who has ignored human suffering (as some claim the peasants do in the painting), has failed to take the middle way of moderation (as it is claimed that Icarus did), and has exhibited pride and arrogance (as it is claimed that both Daedalus and Icarus did). Instead of being the noble peasant, the king/ploughman is actually a sixteenth century personification of all of these human faults. Possibly, the ploughman may be read in more than one way – with the more standard views of him at the more obvious level, and the political and potentially more controversial view being disguised, except for those in the know. The painting’s openness to alternative explanations, together with its intriguing small mysteries, its late rediscovery and the conflict between its two versions, is perhaps why it has remained capable of generating modern interest and relevance. The emergence of the painting in 1912, coincidentally just as the aeroplane was being invented, did not go unnoticed by other artists of the time. John Singer Sargent, for example, had gone to the Western Front to get ideas for a war painting commissioned by the British government. 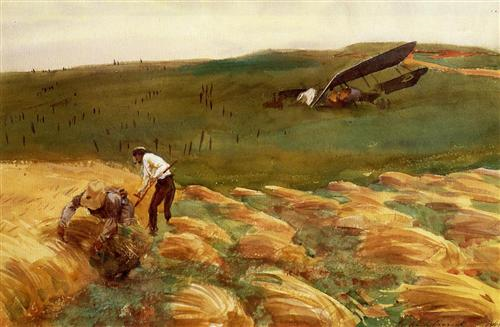 It has been suggested that his resultant work, Crashed Aeroplane, echoes Bruegel’s Fall of Icarus in a number of ways – a bent-back farmer is at work in a field, seemingly oblivious to the crashed biplane that has fallen to earth and is half submerged beyond and behind him (Fig 7). The contours of the sheathed hay in the field in the foreground may also recall the furrowed lines of the field in Bruegel’s painting . 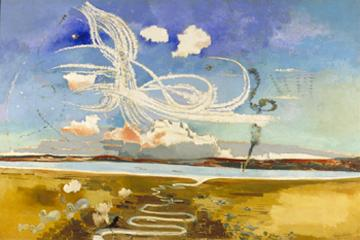 It has also been suggested that Paul Nash’s 1918 painting The Battle of Britain (Fig 8) is a modernising of Bruegel, with a similar bird’s eye viewpoint, a yellowish foreground and water/sky background, an object (the plane) plummeting nose-first into the water, the puffs of cloud or smoke recalling the plumes floating after Icarus, sinuous vapour trails recalling the billowing sail of the ship, the curves of the river recalling the furrows in the field, and so on. Nash may have had a private reason for thinking of Bruegel’s painting – he has been quoted as saying that “I have always been more or less attracted by the idea of being able to fly…My ambition was just that of poor [Icarus] – to be able to launch into the air of my own volition, and to sustain my flight like a bird”. And of course, Auden’s poem was published shortly before Nash did his painting, so may have well been in his mind . Culturally, too, Icarus has lived on. There have always been those who considered that Icarus’ feats of reckless daring in seeking a great achievement were not necessarily deserving of the moral disapproval, blame or punishment that have often been applied. Even back in the sixteenth century, Spanish poets such as Jacopo Sannazaro and Luigi Tansillo glorified Icarus, celebrating his audacity and defiance of human limitations, instead of condemning it . And by his death obtains so great a prize! “Icarus” has also become a popular name suggesting enquiry and adventure in a wide variety of modern contexts – the Greek Air Force Academy is reportedly known (rather alarmingly) as “Icarus’ School”; there is a magazine called Icarus on solar system studies; an organisation devoted to studying migratory movements through a satellite system (the Icarus Initiative); and the Icarus Trophy which is awarded for the winner of a long distance air race. In this article we have touched on some of the many interpretations that have been made of the Landscape with the Fall of Icarus, without in any way attempting to be exhaustive . However, whichever interpretation may be adopted, the common thread is that nothing in the painting is as it seems. Every image seems to be capable of multiple interpretations, many of which seem entirely possible. This is partly because Bruegel’s unusually quiet and restrained treatment reveals little of his own feelings or intentions. It is also partly because of the composition of the painting, with its supposedly vital characters almost invisible and even faceless, which makes it quite uncertain as to who or what the painting’s real focus is. Partly, too, it is because what little we know of the painting comes from two copies which differ in material ways. So, for example, the idyllic, peaceful-looking setting turns out to be a stage for death, pride, ambition, suffering and retribution. The bird-like, god-like Icarus meets a fate which is all too human. An insignificant-looking partridge turns out to be a metamorphosed human who acts an instrument of retribution. Daedalus is either present or perhaps he isn’t. The ploughman is either a callous bystander, a noble peasant or a rapacious ruler. The sun is supposed to be either up or down. An innocent-looking furrowed field turns out to have an abandoned corpse lying on its edge (and maybe it’s something else entirely). A shepherd looks upward, but there is nothing to see (or is there?) A painting that is supposed to depict a fall shows only its termination. A dagger lies on the ground, but why? And we’re still not even sure that the painting is really by Bruegel. This painting illustrates both the ingenuity and the limits of art historical research. Some would argue, with some force, that it is a pointless exercise to even try to extract “the meaning” of a painting. However, while it may be natural for a viewer to form a preference for one interpretation or another, your personal experience of the painting can be enriched by an appreciation of some of the various interpretations that it may bear, and – just as interesting – of its mysteries which may always remain unsolved. 1. Pieter Bruegel, also known as Bruegel the Elder (1525-1569). Before 1559 his name was also normally spelled “Brueghel”. 2. Timothy Foote, The World of Bruegel c 1525-1569, Time Life International (Nederland), 1971 at 16-17. 3. Foote, op cit at 18; Bernhard Ridderbos, Anne Van Buren, Henk Van Veen, Early Netherlandish Paintings: Rediscovery, Reception and Research. Amsterdam, Amsterdam University Press, 2005. 4. Georges Hulin de Loo and René van Bastelaer, Peter Bruegel l'Ancien, son œuvre et son temps: étude historique, suivie des catalogues raisonnés de son œuvre dessiné et gravé, (ed Van Oest), 1905; Johan Huizinga, The Waning of the Middle Ages, 1919. 5. Purchased from the Sackville Gallery, London for £100. The painting is on canvas. Earlier suggestions that it had previously been transferred from wood have recently been discounted: Christina Currie and Dominique Allart, The Brueg[h]el Phenomenon, 3 vols, Brepols Publishers, Turnhout (Belgium), 2012 at 846, 848. 6. See generally Currie and Allart, op cit at 844 ff; Lyckle de Vries, “Bruegel’s Fall of Icarus: Ovid or Solomon?” Simiolus: Netherlands Quarterly for the History of Art, Vol. 30, No. 1/2 (2003), pp. 4-18; and Karl Kilinski II, “Bruegel on Icarus: Inversions of the Fall”, Zeitschrift für Kunstgeschichte, 67. Bd., H. 1 (2004), pp. 91-114. 7. The Beaux-Arts version is (73.5 by 112 cm (28.9 × 44.1 in)). The van Buuren version is 63 by 90 cm (25 × 35 in). 8. Currie and Allart, op cit at 844; De Vries, op cit at 3. 9. Currie and Allart, op cit at 845 ff. That work was probably a painting, but could merely have been a cartoon with colour annotations. Currie and Allart state that both copies were executed after Bruegel’s death, but reject any suggestion that either copy was executed by Bruegel’s son, Pieter Bruegel the Younger (at 864). 10. In the rest of this article, references to “the painting” mean that part of the Bruegel composition assumed to be common to both versions. Currie and Allart, op cit, believe that the van Buuren version is probably closest to the original. 11. De Vries, op cit at 5. 12. Man of War with the Fall of Icarus (c 1562) and River Landscape with Daedalus and Icarus (c 1553). 13. Man of War Seen between Two Galleys, with the Fall of Phaethon. A rocky fortress-like island also appears on the left in the painting and also in the etchings, other than the River Landscape. 14. Falling also features prominently in Bruegel’s non-mythological paintings such as The Fall of the Rebel Angels, the Conversion of Saul and the Parable of the Blind. 15. As we will see, the Icarus myth involves both actual and metaphorical human-bird transformations. Similarly, with the Phaethon myth, the mourners of Phaethon find themselves becoming transformed into a tree or a swan: Kilinski, op cit at 97. 16. Metamorphosis, Book 8, 183-235. 17. The Icarian Sea, later known as the Aegean Sea. 18. The viewpoint is similar to that in Return of the Hunters; see our article on Winter Landscapes. 19. Yoni Ascher, “Bruegel’s Plowman and the Fall of Art Historians”, IKON Vol 7/2014, 225ff. It is often assumed or stated that Ovid says that all three witnessed the flight, but this is evidently not so, as he refers to them disjunctively. 20. The faint trail of feathers from Icarus’ fall, and the inclusion of the Ovid-based workers from the myth are almost the only clues. 21. Kilinski, op cit at 103. 22. Anne Hollander, Moving Pictures, Harvard University Press, Cambridge and London, 1991 at 94 ff. 23. The sun disc may actually have been added to the painting by a later restorer: Currie and Allart, op cit at 855. 24. Of course, in reality, the higher Icarus went, the colder it would have been, as any pilot or mountaineer can attest, but let’s not quibble. 25. The generally more golden colour of the Beaux Arts version is due to the yellowing of the varnish. The van Buuren version is probably closer to the colour of the original: Currie and Allart, at 855, 863. 26. The name “Perdix” has, incidentally, been adopted in English as the species name for a type of partridge. 27. Currie and Allart, op cit at 854. 28. For overviews, see note 6. 29. See for example Kilinski, op cit at 94. 30. Foote, op cit at 149. 31. Alexander Nemerov, “The Flight of Form: Auden, Bruegel, and the Turn to Abstraction in the 1940s, Critical Inquiry, Vol. 31, No. 4 (Summer 2005), pp. 780-810, at 784. 32. Robert Baldwin, “Peasant Imagery and Bruegel's “Fall of Icarus”, Konsthistorisk Tidskrift, LV, 3, 1986, 101-114. Auden wrote about these experiences in a book, Journey to a War, with Christopher Isherwood (1938). 34. Alexander Wied (transl Anthony Lloyd), Bruegel, Bay Books, Sydney, 1980; Kilinski, op cit at 102. This proverb is also used is also used as a justification for the “death in the midst of life” interpretation discussed later. 35. Baldwin, op cit at 101. 36. Wied, op cit at 84. This also appears to be the view of William Carlos Williams in his poem, where he says that “unsignificantly / off the coast/ there was/ a splash quite unnoticed/ this was/ Icarus drowning”. In reality, of course, if Icarus had fallen from a great height, he would almost certainly have died on impact, rather than drowning. 37. Kilinski, op cit at 114. 38. Kilinski, op cit at 102-3. 39. De Vries, op cit at 8. 40. Currie and Allart, op cit at 844 - 845. 41. See discussion at de Vries, op cit at 7. 43. E Matt Kavaler, Pieter Bruegel: Parables of Order and Enterprise, Cambridge MA, 1999, 62-76. 44. Kilinski, op cit at 96. 45. It should be noted, though, that Daedalus does not take the middle way in devising an extreme and unnatural method of escaping (though what the ‘middle way’ for escaping jail could be is not clear). For this, he is punished by contributing to the death of his son. 47. Nemerov, op cit at 790. 48. Nemerov, op cit at 791. 49. Jacob E Nyenhuis, Myth and the Creative Process: Michael Ayrton and the Myth of Daedalus, the Maze Maker, Wayne State University Press, Detroit, 2003, at 46. 50. Cited in Wied, op cit at 84. 51. Lauro de Bosis’ verse-drama Icaro. 52. For example, Harries refers to the scene as an allusion to the biblical story of Cain and Abel: Karsten Harries. Infinity and Perspective, Cambridge, Ma: MIT Press 2002, at 101; and De Vries, op cit at 10 contrasts the traditional working landscape and the emerging importance of ships in the development of trade and industry.